When I picked up Stones for Ibarra, all I knew about it was that I had seen the title many times over the years and it was only $1.50. 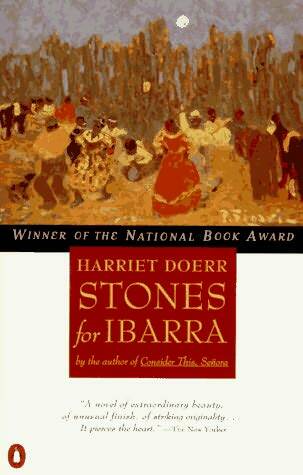 Now I look, and the googles tell me that Stones for Ibarra was Harriet Doerr’s first novel; that she wrote it at the age of 73; and that it won the National Book Award. Even more fascinating is that she went back to college after a 30-some year absence to get a Bachelor’s degree in history at the age of 67. Originally written as short stories, Stones for Ibarra tells the story of Richard and Sara Everton who move from San Francisco to Mexico in the 1960s to revive a family copper mine that has been out of use since 1910. While somewhat episodic, and despite its beginnings as a few short stories, the novel hangs together and has more of an arc then you would normally encounter in a book of linked short fiction. Early in their struggle to bring new life to the old mine Richard is diagnosed with leukemia. Told from Sara’s point of view, their struggles and those of the people and the world around them is described with straightforward but rather atmospheric and somewhat abstract detail. I know that sounds like an oxymoron, but Doerr’s writing has a poetic quality that doesn’t compromise comprehension. It offers enough detail that one doesn’t scratch one’s head wondering what is going on. The reader is told early on that Richard and their efforts to revive the mine only make it six years past his diagnosis. Those years, autobiographical on the main points, are described by Doerr like a memoir that is as grateful as it is elegiac. Doerr’s writing brings impoverished rural Mexico to life and looks at the humor and frustration of being a fish out of water. Although sympathetic to the culture and the plight of the community around them, there is a certain amount of the colonizer evident in Doerr’s tale. *I have become so confused about when to use the British ‘s’ and when to use American ‘z’ in words like cozy/cosy that I almost went back and changed ‘zone’ to ‘sone’. I just finished “Stones for Ibarra” a few weeks ago and have been, I'm sure, annoying to my friends in insisting that they read it too. I thought it was a marvelous tale of the ex-pat life as seen from both sides and a remarkably touching love story. It was an interesting plot device for the author to divulge the sad fate of Richard in the first paragraph but made sense as the book went on. We spend no time wondering what will happen to him and are freed, in a way, to just savor the wonderful writing and the sensitive story.